A little overdue on posting a new report! 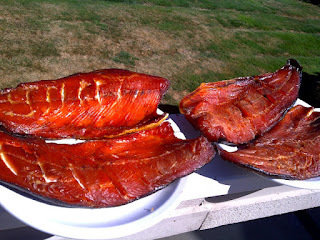 Halibut season is now closed, so full attention has switched back to salmon. There are still a few spring/chinook salmon around, but most anglers are now focusing on coho. The location of the schools change daily, but it's a pretty good bet to troll in deep water, 250-500 feet, from Beechey Head to Otter Point ... and once you find a school, stick with it. The coho can be found from the surface down to 100 feet. The problem, though, is you can only keep hatchery coho in Sooke waters, so you may have go through a lot of wild coho until you find a hatchery keeper. West of Sheringham Point, after Oct 1st, you can keep 4 coho, with up to 2 of them wild. Pictured is the best part of coho fishing ... about 18 hours after hitting the dock, shortly to be served up with cream cheese, purple onions, and crackers ... mmm mmm.